Excuse my dust! 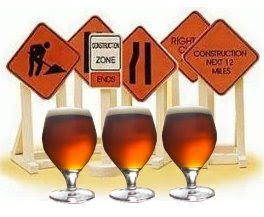 This old beer blog is currently going through some major renovations over the course of the next week or so. I got tired of the old blog template and thought it was time to bring the blog up to a more modern look. I'm attempting to bring you more information at a glance while trying to make the site a bit more interactive and social at the same time. This entire process is making me realize that there is a lot more to Blogger than meets the eye. I'm finding out that it can be tweaked to work like any other blogging site you see out there. While my main profession is supporting web sites for other customers, I find that I've spent far too less time supporting my own. So please excuse the site for a bit while I make some overhauls. For my regular readers, I'm interested in your feedback. What do you think of the new look so far? Good, not so good, indifferent? If you've gone through your own blog site renovation in recent months, please post a comment below and share what you went through. I'd be interested in your experiences. I've recently added Google FriendConnect to the site. It allows people to join the site with a common shared Google interface, interact with each other on multiple member sites and also let's readers post messages to each other on their sites. Scroll down a bit on the right side near the bottom and sign-up. Would love to know what everyone is up to. I plan on adding additional navigation to the top part of the blog including ways to get in touch with me and highlighting special topics on the blog. It's fun to tweak the look and feel, but at the same time I'm hoping to get it done so that I can get back to writing and doing more homebrewing! - Can we really choose a favorite beer? - How did you get into good beer?